ATENA is also a great tool to support experiments. 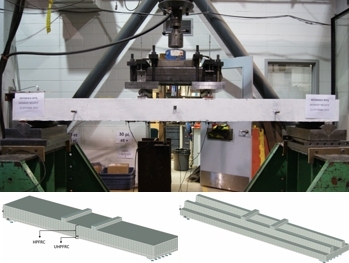 This is the case at Polytechnique Montréal (Canada), where experiments on the mechanical performance of full-scale fibre reinforced concrete (FRC) bridge elements under static and dynamic loading have been conducted for more than a decade. Recently, precast slabs have been tested under bending loads by M.Sc. 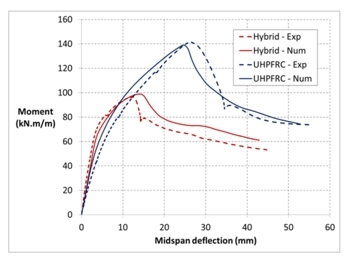 candidate Frédéric Lachance in order to assess the mechanical behavior of innovative designs using high and ultra-high performance fibre reinforced concrete (HPFRC and UHPFRC) materials. In this research project, ATENA 3D was used for preliminary design of the experimental setup and for better insight and understanding of the experimental results of the precast slabs. The 3D numerical models used the ATENA Cementitious2 User constitutive law, which was specifically developed for modelling HPFRC and UHPFRC materials. Two FRC precast slabs were modelled. The first one is a hybrid slab design, made of HPFRC with a 30 mm UHPFRC overlay. The second precast slab design is made only of UHPFRC. 3.0 m long and 0.6 m wide precast slab specimens were produced in HPFRC and UHPFRC at a precast plant. They were submitted to four-point bending loads. The results in Fig. 7 show the bending moment in function of the mid-span displacement of the slab under negative bending. One can observe the good correlation between experimental and numerical moment-displacement curves. Cracking patterns and rebar stresses measured in the slabs were also well reproduced with ATENA 3D.